I love when I get to be a part of a large-scale effort to promote literacy. And I REALLY love when I get to do this in-person and seeing the look of joy on people’s faces when they receive something fantastic. That said, I am absolutely applying to be a World Book Giver next year! 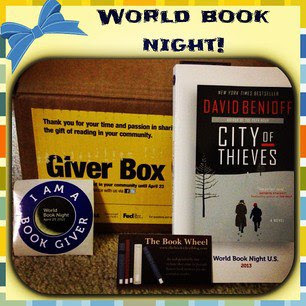 This past Tuesday, April 23, was World Book Night. Basically, thousands and thousands of volunteers around the world give out books, for FREE, to random strangers. The idea is to get books into the hands of people who are not regular readers and to promote the importance of reading and books. I originally applied to give out my books (City of Thieves by David Benioff) at a local state park. The idea was that I’d head to the lake and walking paths and hand books out to those that were taking the day off to relax. Of course, a cold front moved in and it snowed, instead, so I had to alter my plans slightly because no one was going to be picnicking at the beach in 24 degree weather. Instead, I walked around my town and randomly handed books out to people. To be totally honest, I expected at least a few people to be less-than-thrilled about receiving a book because not everyone is a reader. BUT, I didn’t have ANY of those people and everyone I met was really excited! 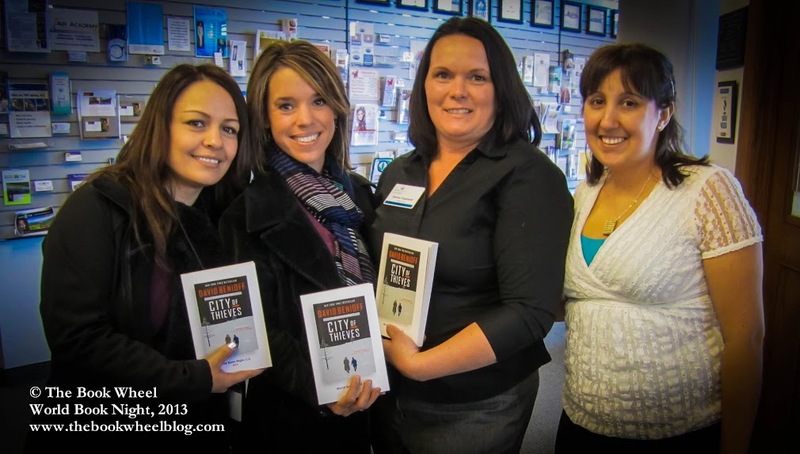 I had 20 books to give out, and my two favorite people were numbers 2 and 20. Number 2 was an older man who was on vacation and, not expecting the cold weather, needed something to do. He was all smiles and he ramped up my excitement for the day. Number 20 was a man who, through a slight language barrier, couldn’t believe that I was giving him a book – for free – and that I didn’t write it (it didn’t occur to me that people might think I was promoting my own book, not a bestseller). Despite the cold and dreary weather, this program lit up my day and I cannot wait to do it again! So thank you, World Book Night, for affording me this opportunity!